As an SEO Manager, it’s your job to steer the SEO ship in the right direction. You’re the SEO expert, which means you’re the one making the recommendations. But now it’s time to figure out what goes into your SEO recommendations report. Want to create SEO recommendations like a pro? 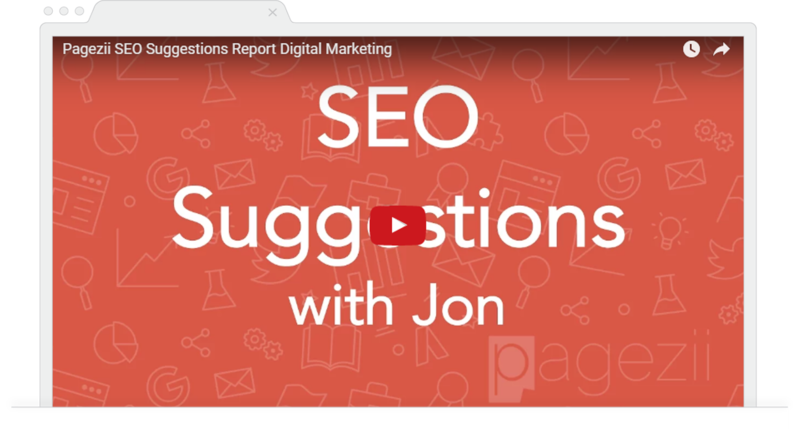 Check out our SEO suggestions webinar tutorial. 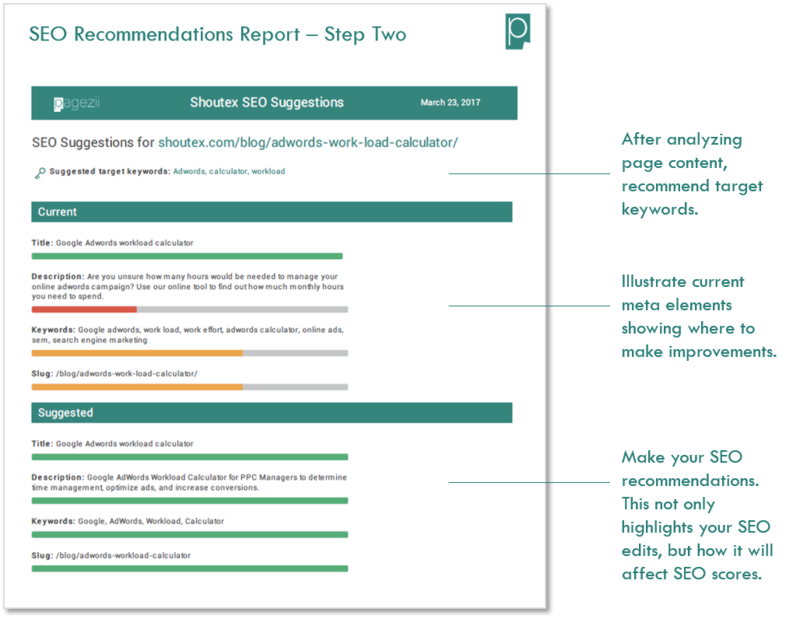 Start out your SEO recommendations report with an SEO page breakdown. Because your digital marketing team doesn’t have the SEO knowledge you do, provide context. This sets the stage for your recommendations report. 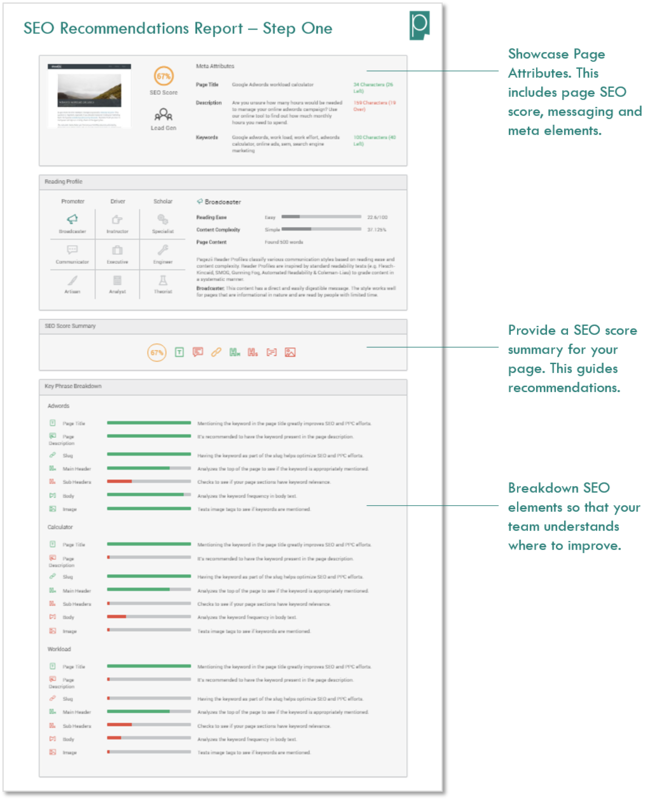 Show the page’s overall SEO score, SEO score summary, and a detailed keyword breakdown. This data helps different parts of your team. For example, stakeholders may only care about SEO scores. They’re looking at SEO from a macro perspective. So SEO score is all that counts. Detailed SEO breakdowns are going to help your content marketing team. It’s going to show them what to look out for in the future. Now it’s time kick start your report with SEO recommendations for meta elements. These elements have high SEO impact when it comes to boosting rank. This makes it a good place to start. Your goal as an SEO manager is to highlight where your current meta elements are lacking, and how to improve. Feel free to add a few pointers to your SEO recommendations reports for future reference. Because Enterprise SEO deals with thousands of pages, this is going to streamline your process in the future. Talk about the importance of target keywords in meta elements. Show how and where to use target keywords. After you’ve made SEO recommendations to your meta elements, it’s time to get into the nitty-gritty. 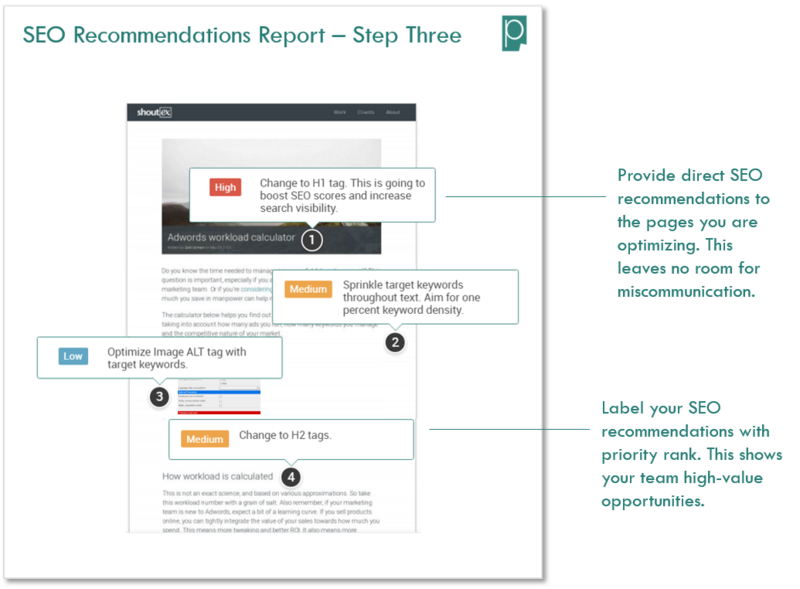 The third step of the SEO recommendations report is where you get into the nuts and bolts. Here you want to take your page content to the next level through SEO. Here’s where communication lines can get crossed. So it’s your job to make SEO recommendations clear. Show exactly where to make SEO edits using labels. Within your labels, you’ll want to provide the SEO edit and pointers for future reference. It’s also a good idea to prioritize SEO edits. This is useful for content marketers writing page content. In the future, they’ll know where to drive high SEO value. Above we’ve laid out a simple guide for SEO Managers. The objective of your SEO recommendations is to provide your expertise in a concise report. Do this by crafting a straightforward document. Only include the essential information your stakeholders, content, and web teams need. Remember, they’re just as busy as you are. SEO page analysis to highlight content you’re optimizing, and to show current SEO performance. Meta element optimization for major SEO improvements. Page content optimization for the SEO nuts and bolts. Is there anything else you would add to this SEO recommendations formula? Let us know in the comments below.